Everybody has a few dishes that they make that are miles above the same dish when made by someone else. Don't they? For example, I am basically in the kitchen at any given hour; cooking, baking, testing, experimenting, eating, or just thinking about food in some form or another. It's what I do. But that doesn't mean that I don't enjoy eating somebody else's cooking every now and again. However, there are two or three dishes that I make better than anyone else. For me. For my tastebuds. And I know that just because I think something is the best, it doesn't mean that you will think it's the best. But sometimes, you've just got to toot your own horn. That's okay. It's healthy to appreciate your talents. One of my talents is making hummus. I make a seriously mean hummus. It was actually my fourth-ever blog post, which means that I've been churning out good hummus for at least the past five years. So yes, I like hummus in general. I'll eat hummus if you make it. And I'll like it. I'll eat store-bought hummus. I'll like that, too. But I get silly with a batch of "my" hummus. I scoop it up with warm pitas like it's going out of style. I slather it on toasted bagels. I eat it on veggie sandwiches. I dip major amounts of roasted broccoli in it. I eat it from a spoon. And so does my hubby. And my mom. And even the guy that mom dated for a number of years who declared it the best hummus that he'd ever eaten (and apparently he'd eaten a lot of hummus in his lifetime); and this was before he knew that it was homemade. So, I'm fairly confident in proclaiming this particular skill to the world. So why in the world would I mess with perfection? Well, because it's winter squash season. Hello! I couldn't get the thought of adding some pureed pumpkin to my hummus out of my head. A big bowl full of rich, deep orange-hued hummus was playing on a loop in my mind. I did stick to my basic formula, changing only a few minor things from my main formula that I thought would play up the pumpkin well. And man, did I get it right. This Pumpkin Hummus is equally as addictive and mind-blowing as the original. When you've got it, you've got it. Oh, p.s. 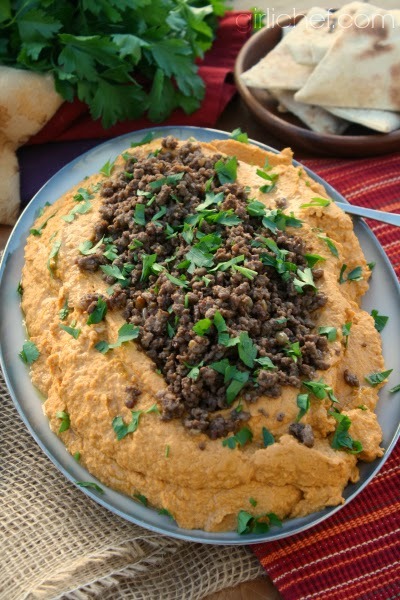 - there's also some lightly spiced lamb strewn across the top of the hummus for your eating pleasure. So, make a big platter and toast up a bunch of pita bread - you and your guests will make quick work of this. And if you don't? Call me, I'll come over and finish it for you. 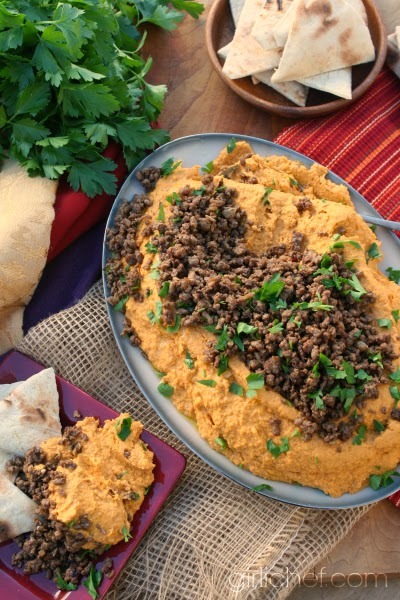 Pumpkin adds beautiful, rich color and extra fiber, vitamins, and minerals to hummus that is topped with a spiced lamb mince. Place all ingredients in food processor and process until it is a smooth and creamy puree. Set aside while you make the lamb. Heat the olive oil in a large skillet over medium-low heat. Cook, stirring, until soft and slightly caramelized, 10-12 minutes. Add spices and cook another 30 seconds, stirring. Add ground lamb, increase heat to medium-high and cook, breaking up the lamb and mixing everything together, until the lamb is cooked through, about 6-8 minutes. If there is a lot of excess grease, pour mixture into a fine mesh strainer set over a grease-catcher and drain. Taste, and adjust seasoning. 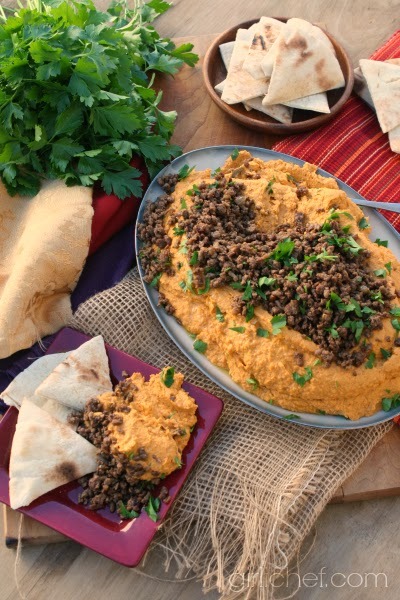 Pile the Pumpkin Hummus on a platter, and make a slight well in the center. 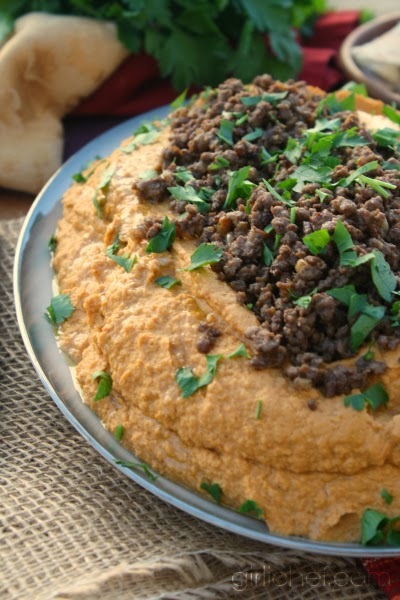 Transfer the spiced lamb to the well in the center of the hummus. Drizzle with a little olive oil, and scatter with parsley or cilantro. Serve warm flat bread on the side for scooping.